The RWTH Mensa menu at your fingertips! What's for lunch today? Check the "Mensa" (student cafeteria) menu plan at RWTH Aachen University directly on your iPhone, iPad, or Apple Watch! 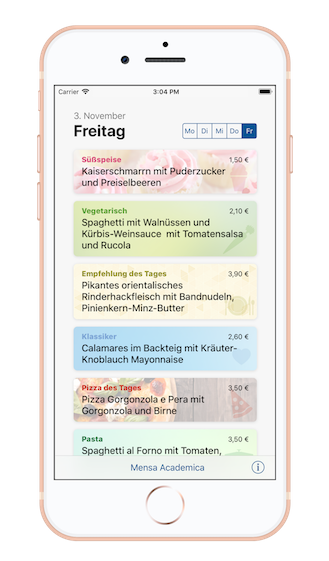 iEat is free, and it lists the menus from all RWTH Mensas, bistros, and cafeterias. The app displays dishes by day and location in a simple and intuitive way. iEat was developed by Thorsten Karrer and Jan-Peter Krämer, iEat Mobile by Jonathan Diehl, and is currently maintained by Sebastian Hueber and Krishna Subramanian, all from the Media Computing Group at RWTH Aachen University. If you encounter any problems, or would like to provide feedback on iEat, just drop us an email. Thanks! Looking for the iEat app for Mac? We have discontinued the Mac version of iEat to focus more on the iPhone app. If you'd like to use a Mac app, let us know!